More than simply a means to learning the content of divinely revealed law, Torah study is an end in itself–according to some, another way of worshipping God. The Torah is portrayed in rabbinic tradition as predating all history, the very blueprint according to which God constructed the universe. To study Torah in depth, then, is to do more than learn prescribed behaviors; it is to approach an understanding of the foundations of all existence and the pathways of the divine. According to some rabbinic sources, therefore, the Israelites’ acceptance of the Torah at Mt. Sinai enabled the world to continue to exist and not be plunged back into primordial chaos. 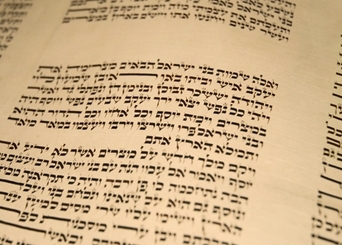 The way Jews have traditionally studied Torah begins with a bold assumption: that classical sources have the answer, or many answers, to all contemporary questions and issues. The accumulated wisdom of many generations of commentators is often (in printed texts) presented on the same page as the sources upon which those authors are commenting. This technical feature of Jewish texts reflects–and also helps create–a perception that a conversation is taking place, on which the learner begins to eavesdrop and into which she or he is soon drawn as a participant. Engaging in dialogue is also fostered by the tradition of studying with a partner (in chevruta, literally “friendship”), interpreting and debating aloud. This tradition has ancient roots, but has been re-emphasized in recent centuries. A d’var Torah is a short talk based on a classical text or theme of relevance to the occasion when it is delivered. Often, the relevance is direct: the text may be a biblical passage that has been recited aloud on that Shabbat or holiday, for example. The d’var Torah takes many forms, but the common element is that the points made must be of more than academic interest. The presenter should have something to say that is of relevance to the personal or communal lives of the audience. A well-constructed, well-delivered d’var Torah, even a very short one, can give the participants in an event with a formulaic liturgy (such as a prayer service and wedding ceremony) a sense that something special, unique, and personal has transpired.